There is a myth about the Hollywood Blacklist. The “Hollywood Ten” were dragged before the House Un-American Activities Committee (HUAC) and grilled on their associations with Communism, hid behind their Fifth Amendment rights, and refused to name names of Hollywood Communists. They were completely shut out from the filmmaking industry by Congress and considered the heroes of the hour by many in Hollywood. But it’s time to set the record straight. 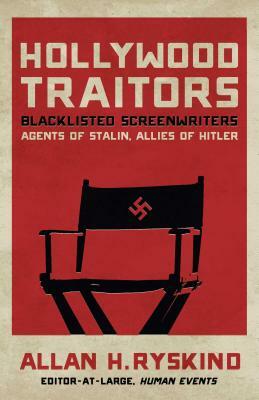 In Hollywood Traitors: Blacklisted Screenwriters—Agents of Stalin, Allies of Hitler, Allan Ryskind reveals how the alleged “victims” of the Hollywood Blacklist were actually ideological thugs: enthusiastic Stalinists committed to bringing about a socialist utopia in America—even by violent revolution. Ryskind, a long-time editor of Ronald Reagan’s favorite publication, Human Events, tells the true story of how these screenwriters prostituted their talent in the service of anti-American, pro-Communist propaganda. Ryskind pens the riveting report from an insider’s perspective. His father, Morrie Ryskind, was a screenwriter in Hollywood and was joined by Ronald Reagan, John Wayne, Walt Disney, and others at the forefront of the anti-Communist movement in Hollywood—even at the expense of their careers and reputations. Many major films clearly toed the Soviet line, including Casablanca, Arise my Love, Paris Falling, and Mission to Moscow. Allan Ryskind is the son of Hollywood screenwriter Morrie Ryskind, who co-wrote many screenplays on the Marx Brothers and many Broadway musicals. His father, along with Ronald Reagan, John Wayne, Walt Disney, and many others, led the charge against the Communist movement in Hollywood. Mr. Ryskind, who covered Capitol Hill during much of the Clinton presidency, has been a reporter and editor with Human Events since 1959. He currently serves as editor-at-large for the online publication. He is also the author of a well-regarded biography of Hubert Humphrey, the Democratic challenger that narrowly lost the presidency to Richard Nixon in 1968. Mr. Ryskind resides in the D.C. metro area with his family.